Awesome Friday! 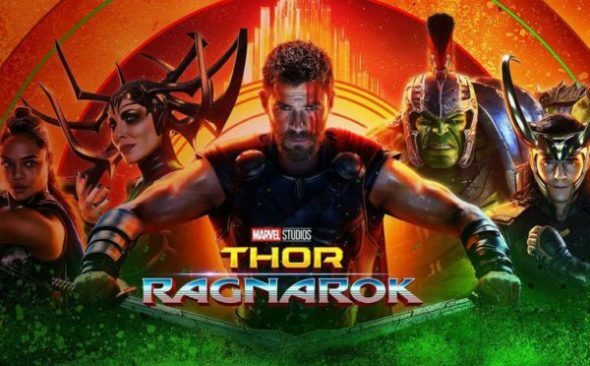 » Blog Archive Review: Thor Ragnarok - Awesome Friday! To reveal too much of the story would be to spoil the sublime subtle reveals that roll thick and fast. One of the pleasures of Ragnarok is that it’s mostly quite hard to predict where it’ll go next, and it often does so in a heartbeat. Suffice it to say, Hela – the Goddess of Death – is back from extended leave, and she’s eager to restore her former glory. This puts Asgard in her firing line, but an overwhelmed Thor gets tossed to a faraway planet while trying to stop her. This new planet, run by Jeff Goldblum having so much fun, features gladiatorial battles that eventually bring Thor and Hulk back together. From there, it becomes a tale of how the two can join with those around them to try and stop Hela. I don’t think I’ve ever written such a vague description of a plot, but it’s entirely intentional. There’s so much I want to tell you here, from the characters they meet, to the outstanding comedic beats that run through the film’s entire runtime. What separates Ragnarok from the whole rest of the Marvel Cinematic Universe is not just the thick, layered comedy (which works surprisingly well when you hear that a reported 80% of the script came from improvisation), but the sense of heart behind every scene. No-one’s outright playing it for laughs, and that’s why it works so well. There’s constant humour, sure, but mixed in are calm moments of self-reflection and emotion, together with many sensational action scenes. No, that’s not enough; the action scenes are some of the best I’ve ever seen in any genre. It turns out that Taika Waititi isn’t just a great comedic director; his action cinematography and choreography is that of a seasoned pro. From the opening twenty minutes – easily the best “classic” Thor fight ever filmed – to the climactic battle on, under, and over the bifrost bridge, the action constantly leaves jaws on the floor. Personally, it was all about the camera; echoing the paintings that tell so much of the film’s exposition, the wide angle and passive shots let us watch the sets of moves unfold in pure glee. And on top of all this, every aspect of the film’s design was stunning. Vibrant colours, gorgeous spaceships and brilliant costumes all worked to highlight the spectacular synth score. Just like Guardians Of The Galaxy before it, Ragnarok was also happy to hit play on a classic tune at the exact right moment. All you can do is sit back and get swept away by the whole thing. It ultimately seems like the best decision the filmmakers made was to release Chris Hemsworth from his stoic prequels and just let him have fun. His performance has the exact balance of power and goofiness, innocence and wisdom. Everyone else is also on a high; Mark Ruffalo plays a beautifully skittish Banner and grumpily-perfect Hulk, Tom Hiddleston has never been better as Loki, and Tessa Thompson’s gorgeous, kickass Valkyrie rounds out the ensemble perfectly. Cate Blanchett and Karl Urban are also on top form, even when sometimes you didn’t want to the film to cut away from the main troupe. But in the end, the few flaws – a line repeated once too many, the slight imbalance between the two groups – don’t matter at all. You simply won’t have a better time in the cinema at the moment. Thor Ragnarok is a stunning piece of science fiction that is as stylish as it is fun, and is the best Marvel Cinematic Universe movie to date.